SUKIPT 2016 Chess Round 7 has just completed. Below are the results for Top 15 Boards for the Male category. Interesting results? Sure. 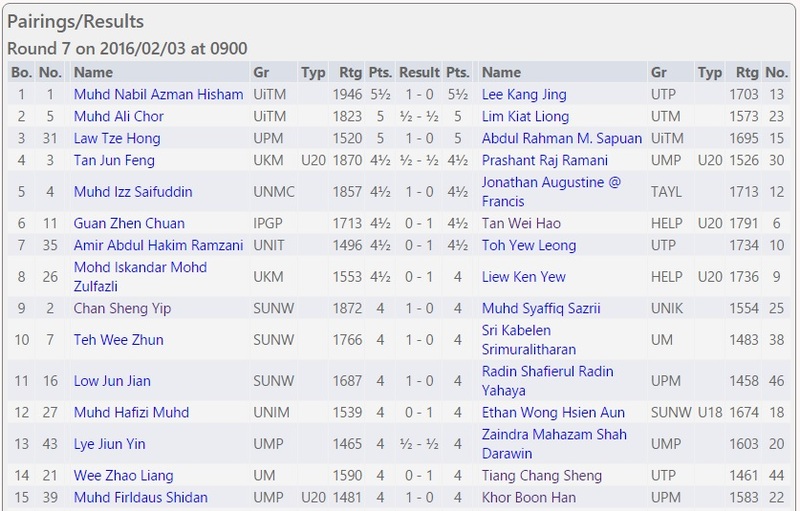 On Third Board, 31st seeded Tze Hong of UPM managed to win against his higher seeded opponent, Abdul Rahman of UiTM. 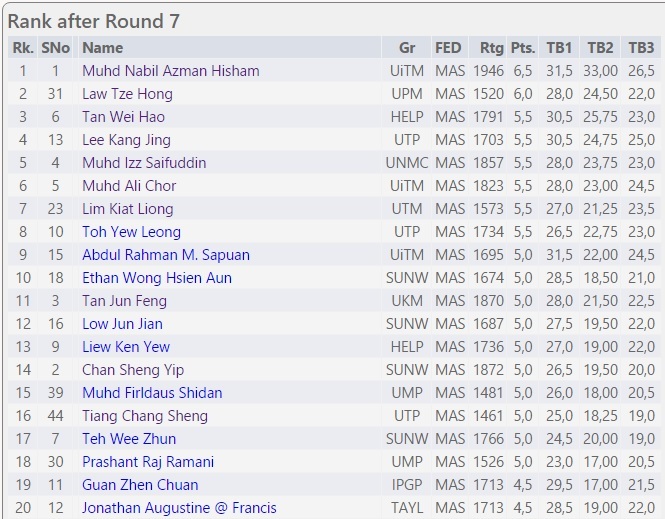 Tze Hong only defeat is to Nabil, the top seed, in Round 2. He won all his last three rounds against higher seeded opponents. He is ranked second after Round 7. On Fourth Board, Preshant of UMP managed to draw with the third seed, Jun Feng of UKM. Jun Feng is very familiar to GiLoCatur. Firstly, he is the elder brother of WFM Li Ting. 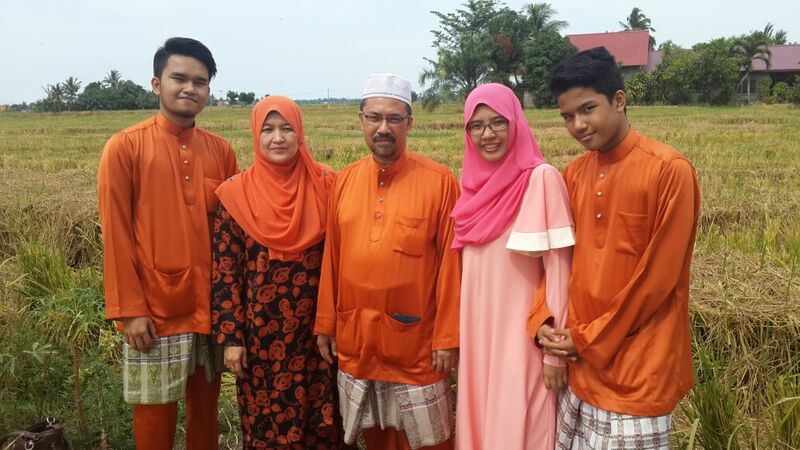 He was a member of MSSMKL contingent where he was a team mate of Fikri in MSSM L18 Team event in 2012 and 2013. In fact, their other team mate is also taking part in this SUKIPT. He is Ken Yew of HELP playing on 8th Board. Several players are familiar to GiLoCatur from MSSM. 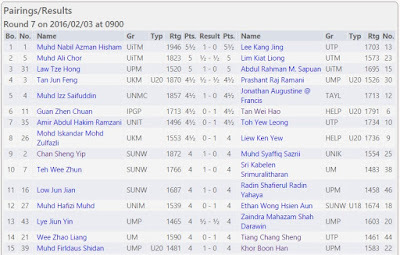 Both Nabil of UiTM and Jun Jian of SUNWAY were members of MSSS chess contingent. Their final MSSM championship was in 2011 held in Penang. Besides Jun Feng and Ken Yew, other MSSMKL players are Muhd Izz and Wei Hao. The former is the most senior of all while the latter is the most junior. In Round 7, both of them won their respective games. 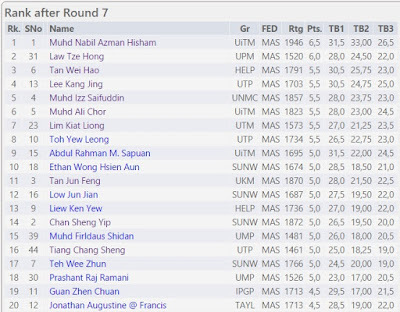 After Round 7, Nabil is leading the pack with 6.5/7 points. Trailing half point is Tze Hong. There are six players with 5.5/7 points. Can Nabil continue his fine performance and win the championship? Let's wait and see after two more rounds.